This is the fifth installment in my Scrivener Series, which showcases how I use Scrivener to write help me write entire novel series. Be sure to check out the previous installments (Bible, Wallowing) or check out my writing process post for a preview of what I’m going to cover next. At this point I’ve got timelines for everyone new, I know when they were born and what shaped them into the horrible horrible people I know and want my readers to love; I’ve also given every major character and the antagonists in the novel their own outlines for the book. So you’d think I had a pretty good idea of what’s gonna happen when and could just get to writing the thing. I’ve said before that the Final Outline is a map of the novel but there’s still room for plenty exploration and getting lost along the way. Before I can even get to the final outline however, I’ve got to get all these headstrong characters’ actions and reactions to merge in a single continuous timeline – and of course they have other ideas. 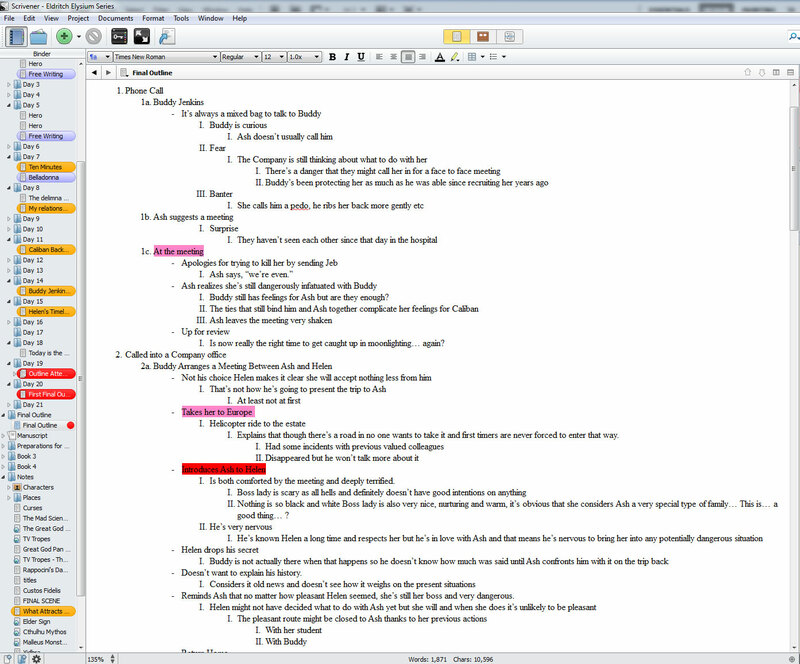 With “Toxic Ash” whose final outline is pictured above, I came to the final outline with five individual outlines (Ash, Buddy Jenkins, Caliban & Caine, Helen) and while the main points line up somewhat in each individual outline, timing, reaction, action and when each individual character wants something to happen – don’t line up at all. Usually it’s close. Very very close. Close enough that I’m often tempted to just merge them together like shuffling a deck of cards and trust it’ll all work out. Unfortunately it’s more like shuffling several different decks of tarot cards, one for each character outline, and that means you’re going to end up with one heck of a muddled reading. Two or more Death cards will appear, two or more Devils, Lovers and Fools; not together probably just far enough out of sync to make deciphering the resultant mess a real headache. So you start over. From the very first scene, letting the characters outlines inform their actions in each scene (a headache and also a big help, especially in the Eldritch Elysium series which is all mostly from one characters POV). As you go you add other elements from your notes (I keep a color key to remind me to put science fiction elements here, romantic elements there, tie ins from previous books here and a foreshadow of the next there) so all of that time consuming research doesn’t go to waste. 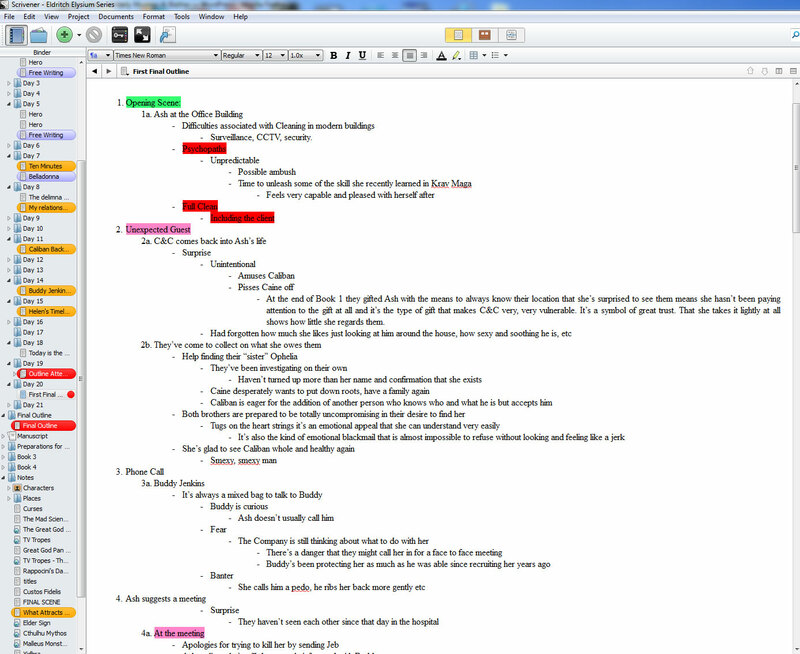 All of that is made easier by being able to keep all my notes and elements open in the same document as I work. 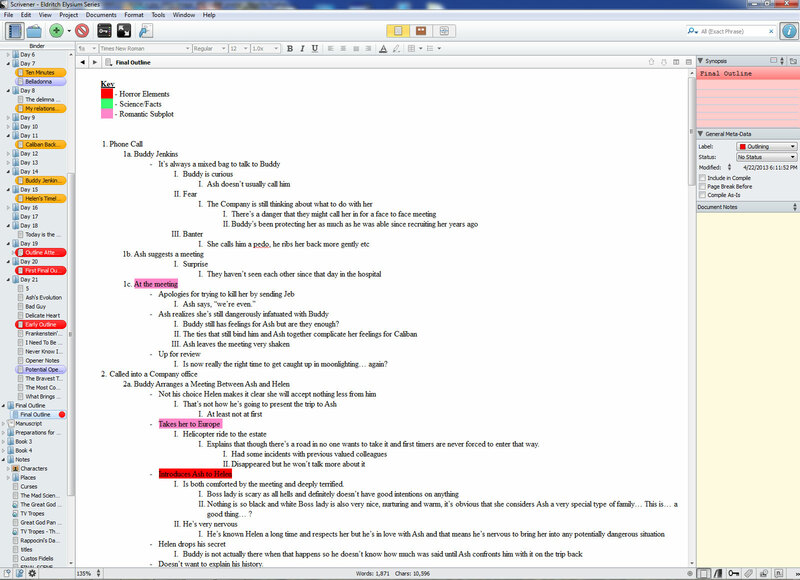 Need to see what Caliban gave Ash at the end of book one, it’s a few tabs up, that bit of research on Shub-Niggurath, two tabs down, information on the rest of Helen’s illustrious family, over there highlighted in purple. So much easier than trying to find all the documents and notes I scrawled on bits of paper and tucked into various folders on my various computers! Allowing for ever richer, more complex, stories. You can also see from the image above how simply I’ve sketched out each scene and chapter. Partial sentences, sometimes just a single word give me a sense of where I’m going but don’t even come close to taking away from the joy of pantsing it – just makes sure I end up lost without a shirt a good deal less likely. Hopefully some of that will be helpful. Be sure to check out the previous installments (Bible, Wallowing, Timelines & Outlines) or check out my writing process post for a preview of what I’m going to cover next. And don’t forget if you want to skip the extra blather about my writing process and go straight to the next book release, you can always sign up for email notification! This is the fourth installment in my Scrivener Series, which showcases how I use Scrivener to write help me write entire novel series. Be sure to check out the previous installments (Bible, Wallowing, Timelines & Outlines) or check out my writing process post for a preview of what I’m going to cover next. Alright, now I’ve got my final outline – my map to the novel – and I’m ready to write the damn thing. When I first started writing novels I wanted to be a total pantser, absolutely certain that if I plotted anything out in advance I’d lose all the magic of the story and possibly end up boring myself silly in the process. Indeed there are methods of plotting that are exactly like that but my final outline isn’t. My final outline is more like having a map on a hiking trip. It keeps me from getting hopelessly lost in the woods but doesn’t ruin the feeling of exploration or wonder at all. It’s up to you and the way you structured your outline really. Mine is a simple list (I love list) of the characters in the scene, the location and a few key actions that happen there in. Sometimes I manage to pull a chapter title out of that mix as well. Mostly I look at the subsections on my outline, get a general heading of the direction I’m going and then work with my characters to write the scene, one word at a time. Everyone’s actual writing process is different but I find it useful to have an idea of how much ground I can cover in a day and trying to push myself a few extra as well. I average about 2000 words per day (about 8 pages) sometimes I under perform and only manage 1500 and sometimes I have a really great day and manage 5000. Chapters will fall where they need to but a lot of the time they seem to have about 10,000 words in them. While I’m writing the actual novel I do everything in my power to avoid even the smallest gap in writing. I skip weekends, holidays and invites out with friends or family. There is no such thing as writers block but there is such a thing as having a hard time getting your novelist cap screwed back on and putting the words on the paper, so I avoid the things that make it harder. Sometimes it’s unavoidable however. When that happens I try working on other aspects of the process like designing the book cover and gathering resources for it. Still with that kind of word output the novel (mine seem to average around 75,000 words or so) can be written in a little over a month! Except there’s almost always a hitch. It just doesn’t work. The flow is off. This bit right here doesn’t have the impact I thought it would. It’s taking too long for this thing to get interesting. Too much blah blah not enough uh huh. At some point in every novel, you’re going to realize something is wrong. Horribly, horribly wrong. So far I’ve been graced with not finding anything so wrong that it couldn’t be fixed with a rewrite but sometimes you look at your whole novel and despair, knowing it has to go right in the trash. When that happens there’s nothing for it but to stop where you are (writing more only makes the problem worse) and re-evaluate your map and everything you’ve done up to that point, figure out where things went wrong and how to fix it. This is where Scrivener’s ability to quickly move chapters and scenes around in their entirety is an absolute life saver! About 25,000 words into “Toxic Ash” I realized the opening scenes were all wrong, making the plot drag awkwardly and sublimating the most exciting parts till way too late in the story. I had to cut it out, rewrite it and put it in later, move that bit to the beginning, write a new opening scene and restructure all the scenes I’d written so far so that they made sense again – a task so large that if I was working directly in Word I might have half assed it or tossed the whole novel out in despair. It was bad even with Scrivener (seriously you should see my trash folder) but I was able to make it through and the book proceeded far more smoothly from there (well there were a few more edits but not anymore complete rewrites so – yay!). By now if you’re an indie publisher, author or hoping to pursue independent publishing in one way or another – you’ve probably heard of Draft2Digital. But just in case you haven’t, Draft2Digital.com is a publishing platform like Smashwords’ infamous meat grinder in that Draft2Digital (D2D) lets you take your unpublished manuscript, format it for various stores. What makes D2D different from all the other publishing platforms? You get access to all the markets at once! That means you can publish on the Kindle, Apple devices, Nook, various other ebook readers and even Createspace from one simple website. Not even Smashwords allows you to publish paperback books at the same time as your ebook and Smashwords’ method of taking your carefully crafted manuscript and placing it on all those platforms is, to be horribly frank, nothing short of putting your work in a mangler and hoping it comes out the other end in a legible format.